Backdropped by the Pacific Ocean that separates China and the U.S., representatives from UC San Diego and Fudan University came together where the body of water meets California, ironically, for glimpses into the rural charm of China’s Sichuan Province. The gathering at the top of Villages West — a UC San Diego high-rise with a coastal view — was for the opening of a traveling photo exhibit from Fudan University, “A Beautiful China,” as well as an homage to what anchors bilateral relations between the two institutions: the Fudan-UC Center on Contemporary China. “We hope this will be the beginning of a new round of visits between our two campuses and build partnerships that are necessary for research and educational institutions in the 21st century to be the best universities in the world: global universities,” said Peter Cowhey, interim executive vice chancellor for academic affairs at UC San Diego. That first round of visits formally began five years ago, with the establishment of the Fudan-UC Center, a hub to connect all 10 campuses of the University of California system with Fudan University, based at the UC San Diego School of Global Policy and Strategy (GPS). 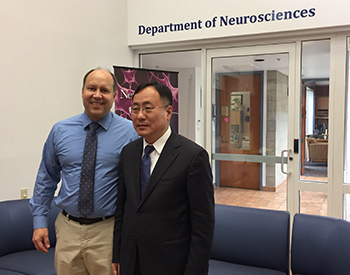 Commemorating this half-decade of friendship on June 5, Cowhey and GPS Acting Dean Gordon Hanson welcomed to campus a Fudan University delegation led by GUI Yonghao, vice president of Fudan University and dean of Shanghai Medical College. Accompanying GUI was ZHANG Yi, executive vice dean of Fudan Development Institute, among others. Representatives from the Consulate General of the People's Republic of China in Los Angeles also joined the delegation on campus. 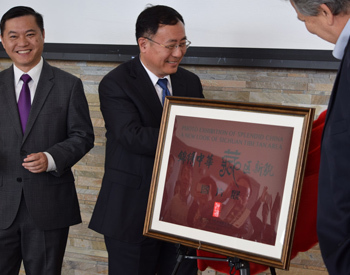 Recalling the establishment of the Fudan-UC Center as an “international milestone,” GUI reminded that the center is the first academic institution established by a major Chinese university in cooperation with a leading North American university. It has since inspired Fudan University’s outlook to internationalize, he said, pointing to the university’s recent collaborations in Copenhagen, Denmark, and Mexico. As well, GUI gave a nod to expanded collaborations between Fudan University and UC San Diego from solely China studies to now areas of cooperation that include, so far, library service, Hellenic history and data analytics. Having visited UC San Diego’s School of Medicine that day, GUI added that he sees potential for cooperation in areas of microelectronics and biomedical research. “We very much need such an internationalized vision, and we’re glad it’s coming to fruition here at UC San Diego,” Fudan-UC Center Director Richard Madsen said and recollected on the numerous interactions, exchanges and dialogues since 2012. In addition to its weekly China Research Workshops, the Fudan-UC Center also instills U.S.-China understandings in the younger generation of students and scholars via its annual Young Scholars Conference. Held for its fourth year in May, the 2017 conference received an outstanding 110 proposals from scholars from around the world, including many from Fudan University and in the University of California system. As well, the Fudan-UC Center has been a co-organizer of the California-Shanghai Innovation Dialogue since 2014. Plus, it has helped to host the inaugural Think Tank Dialogue on U.S.-China Relations in 2016, the same year UC San Diego Pradeep K. Khosla visited Fudan University to renew his friendship with Fudan University President XU Ningsheng. Lastly, the center has launched the Fudan-UC Dispatch to share the cutting-edge research by Fudan and UC scholars in the area of China studies. “Besides the existing program, we have a broad opportunity to expand our cooperation between Fudan University and UC San Diego, not only for research but for faculty and student exchange,” GUI concluded. View more photos from the Fudan University delegation’s visit on June 5.